This is a 21" lol cat necklace. It has alphabet beads saying " I can haz joolry" There is 1 cat on each side of the saying. 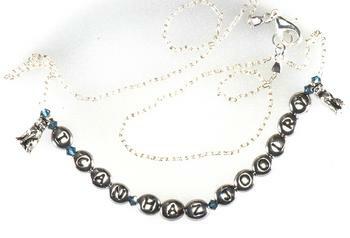 The blue Swarovski crystal beads set the words apart. The chain is very delicate and simple chain that is 1/16" wide. If you need a special size please email me or put it in the notes when you order.